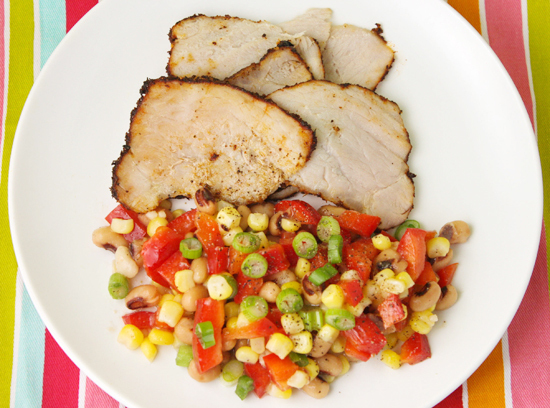 Roasted Pork with Black-Eyed Pea Salad — Pip and Ebby - easy, delicious recipes! The heat from the meat rub, the freshness of the salad and the juiciness of the pork all taste soooo good together. Here I go, making more pork. I had no idea there were so many delicious ways to season, cook and flavor pork. The Other White Meat has officially shown me its true versatility. It's been fun, delicious and satisfying exploring this meat. I still owe you all a post detailing my mother's amazing pork-chop-making process, but in the meantime here is another delicious way to prepare pork! Place 2 small pork tenderloins (10 oz. each) or 1 large tenderloin (1 1/2 lbs.) on a rimmed baking sheet. 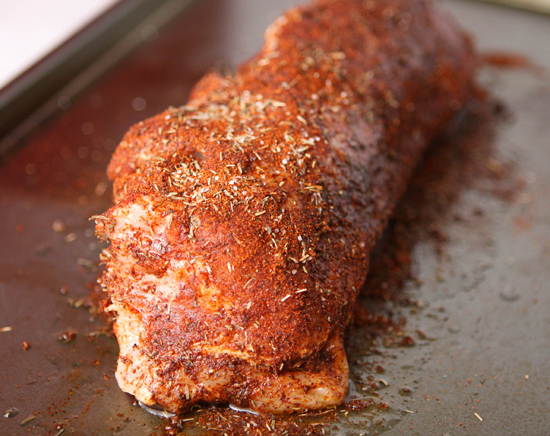 Rub the pork with 1 tablespoon of vegetable oil and sprinkle all over with the spice mixture, patting the meat gently. Roast in the preheated oven until a meat thermometer inserted into the thickest part of the meat registers 150 degrees F. This will take somewhere around 20-25 minutes. Toss the ingredients together and serve with sliced pieces of the tenderloin. Make the pork: Preheat the oven to 450 degrees F. In a small bowl, combine the paprika, thyme, cayenne, 1 teaspoon salt and 1/4 teaspoon pepper; set the spice mixture aside. Place the pork on a rimmed baking sheet; rub with the oil. Sprinkle all over with the spice mixture, patting gently. Roast until an instant-read thermometer inserted in the thickest part of the meat registers 150 degrees F, 20-25 minutes; let cool. Make the black-eyed pea salad: In a medium container, whisk the mustard, vinegar, and oil. Add all the vegetables. Season with salt and pepper; toss to combine. 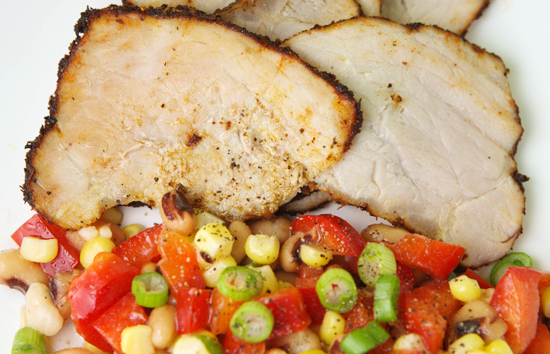 Thinly slice the pork and serve with the salad. The pork and salad can be stored separately in the refrigerator, covered, up to 3 days. Bring both to room temperature, and thinly slice the pork just before serving.